This Celestron T-adapter for Nexstar 4, C40 and C90 is used to screw a single reflex camera -fitted with a T-thread adapter- onto the telescope tube, enabling you to take photographs in the primary focal point (without eyepiece). Your telescope acts a telelens. It is possible to photograph with eyepiece, though. This is called eyepiece projection. Please take into account that the shutter time increases dramatically. 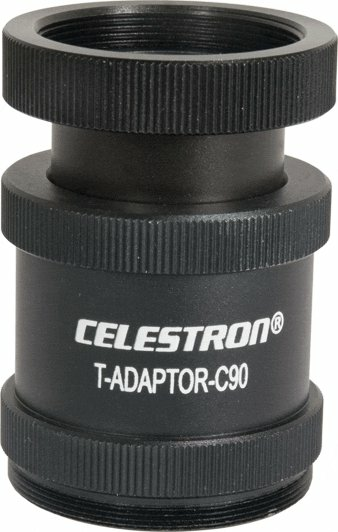 This Celestron T-adapter enables you to attach your 35mm single reflex camera to the primary focus of your telescope or spotting scope. This is used for photography with shorter shutter times, such as terrestrial photography and photography of the moon and planets. This type of photography can also be used with longer shutter times and deep-sky photography when using a separate finder. Both a T adapter and a T ring are to be used to mount a 35mm digital single reflex camera onto your optical instrument. When I 1st bought a T mount for my Nexstar 4 I realised I bought the one that was for the eye piece, then looked up for the C40/90 Adapter that attaches to the rear to join up with the mount. It's Perfect size and stable when screwing the attachment on the back of the telescope, I would recommend it and also recommend using the site for other products relating to the telescope. Just need patience to get the threads of the item and Nexstar 4 in line.